Zombie darlings, you know the party’s never over for the undead. No, they rise again! 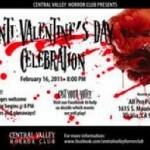 Bring your heart, broken or otherwise, to the Central Valley Horror Club’s Anti-Valentine’s Day event on Wednesday, February 16th, two days AFTER Valentine’s Day, from 8-11pm. It’s FREE and open to all ages. Enjoy a movie (My Bloody Valentine or Silver Bullet), tasty and possibly terrifying treats, and a great giveaway that includes a copy of the loveliest zombie novel ever—Dead Love. The wonderfully weird celebration will take place at All Pro Pizza, 1615 Mooney Boulevard, in Visalia, California. Just the thing for the reborn and love lorn. 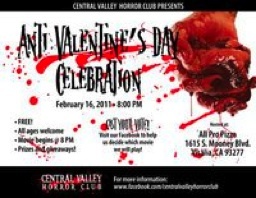 Central Valley seems to be one of THE places to be for all things zombie. I trust that Dead Love is among their cherished items, yes? May be time for you to visit again, eh Erin?